Geotextiles are used in civil construction projects for soil fills to improve soil characteristics. Geotextiles make poor soil more manageable, enabling construction in places that would otherwise be unsuitable. Geotextiles are ideal materials for many infrastructure works, such as roads, harbors, landfills, drainage structures, and other civil projects. Geotextiles are commonly used to improve soils over which roads, embankments, pipelines, and earth retaining structures are built. There are several types of geotextile material, including open-mesh, warp-knitted, and closed fabric or non-woven textiles. Different geotextile materials are specified for various characteristics, such as separation, filtration, drainage, reinforcement, sealing, and protection. When a geotextile is installed between two different soil materials, the function of separation plays an important role. In this case, the geotextile will separate dissimilar materials so the required soil characteristics can be obtained. The main purpose of this type of geotextile is that when water gets into the soil strata, the geotextile will prevent soils from mixing. For example, in road construction, you might want to keep fine sub-grade aggregate separate from the coarse aggregates of the bottom layer. By doing this, the drainage characteristics will be kept intact, preventing the fine aggregate from filling the voids between the larger aggregate. These types of geotextiles have a special thickness and permeability characteristics to prevent soil contamination and allow water to flow through without damaging the strength and structural capacity of the road. Filtration geotextile characteristics are used to allow for water to move in both directions. These types of geotextiles can be woven or non-woven and are used to prevent fine aggregates from moving between soil layers. Depending on the porosity and permeability of the material, geotextiles also can promote lateral flow of drainage water, dissipating the kinetic energy of the capillary rise of groundwater. Geotextiles can be used in both vertical and horizontal applications, helping to solve drainage problems around homes and along roads and curbs. This is comparable to the function of rebar in concrete. Geotextiles are used on embankments and roads being built over very poorly graded soils, allowing for steeper embankments. For such applications, it is always recommended to have design parameters provided by a geotechnical engineer. 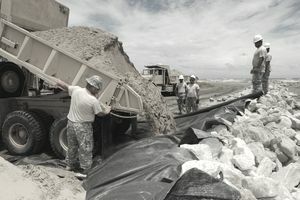 A geotextile fabric can be impregnated with asphalt or other mixes to make it impermeable and thus capable of restricting the flow of liquids in both directions. This requires a non-woven fabric. Impermeable geotextiles may be used to prevent contamination of soil or groundwater from pollutants above or to prevent the loss of potable water due to evaporation or contamination.